Although the mainstream media love to show us every flake that identifies himself or herself with opposition to abortion, they tend to ignore colorful folks on the pro choice side. One of the most intriguing characters of the abortion advocacy movement was (is?) 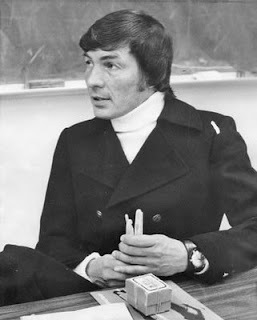 "Dr." Harvey Karman (pictured). I have no clue where Harvey is nowadays. Last I'd heard he was on the lam, trying to avoid yet another arrest. That was just a rumor though, heard about ten years ago. He might be doing just about anything. He might be dead. He might surface anyplace. Harvey, if you're out there, let us know what you're up to. Harvey fancied himself a doctor, and even awarded himself a PhD from an imaginary university in Europe in order to identify himself as "Dr. Karman." Actually, he was a dropout from the UCLA school of theatrical arts. But what did that matter? Harvey didn't have much of an education, but he had limitless chutzpah and an unflagging enthusiasm for abortion. The pro choice movement embraced him without ever checking his credentials. Harvey's background was checkered, to say the least. His rap sheet included nine felonies in Los Angeles County alone, with a lot of those arrests connected to his budding career as an abortionist. He had managed to kill Joyce Johnson in 1955 by performing an illegal abortion on her with a nutcracker in a hotel room. He was sent to prison for this little escapade, but was pardoned by Jerry Brown when he became Governor. A prison record seems to be more of a badge of honor than a stain of shame for an abortionist, because after his release Harvey's career really took off. Harvey ingratiated himself to the administration of a new California abortion hospital after that state legalized, and he set up an experimental program using "super coils," which were plastic springs inserted into the uterus to cause an abortion. Harvey credits himself with having invented "menstrual extraction," or ME, an type of early abortion using a large syringe to create the suction. He joined up with the Federation of Feminist Women's Health Centers in promoting ME as a safe, do-it-yourself kind of abortion. Some women still get together and do each other's abortions with Harvey's technique. Harvey also invented the flexible Karman canula, still in use today by abortionists. Harvey attended various abortion symposia, presenting his ideas about how ME and "super coils" would make abortions so simple that anybody could be trained to do them safely. The government of Bangladesh, along with the International Planned Parenthood Federation, imported Harvey to teach untrained local women in his ME and "super coil" abortions for use on women raped by soldiers. Harvey himself tried a variation of the "super coil" abortion by augmenting the plastic springs with pieces of balsa wood. His complication rate was spectacular, resulting in infections and perforations and nearly killing a large number of his patients. Harvey scuttled back to the United States and looked for more ginuea pigs. In the mean time, the Jane syndicate in Chicago was doing a thriving criminal abortion business. They were also under intense police surviellance. They knew Harvey, whom they had invited to Chicago to teach them ME. When the Jane ring was raided, those members who hadn't been arrested scrambled to find abortionists for the scheduled patients. They approached Harvey, and he aggreed to try his "super coils" on the Jane customers. He made arrangments to use the facilities of an openly operating criminal abortion facility in Philadelphia. Jane chartered a bus to take the women to Pennsylvania. On Mother's Day of 1972, the bus load of Jane clients arrived at the Philadelphia mill. It was a circus. Karman had invited a public television station in New York to send a film crew. Local feminists, who did not share Jane's enthusiasm for Harvey, protested outside. Arlen Spector, who was then Attorney General of Pennsylvania, was scratching his head over what do to. Abortionists across the country were openly breaking the law in order to get arrested so that they could challenge the laws in court. Milan Vuitch had already abolished the Washington, DC abortion law that way. Spector wasn't thrilled about the clinic, but he also didn't want to make a big show of a spectacular raid and arrest only to have the arrest thrown out through Constitutional wrangling. Meanwhile, Harvey and his associates started packing the women with "super coils." Outside, the protestors were letting the air out of the bus tires. Keeping sloppy records, working well into the night, the abortion team managed to pack the 15 patients selected for "super coil" abortions by the early morning hours. One woman ended up hospitalized in Pennsylvania due to lacerations. Others needed to be hospitalized upon return to Chicago. Local health authorities contacted the Centers for Disease Control, which investigated and found that two of the patients had been lost to follow-up, one required a hysterectomy, one was hospitalized for twenty days with infection, and one continued to bleed until she became anemic. In total, nine of the 13 patients who could be tracked down had suffered complications. The CDC suggested that, "Until the super-coil abortion technique is demonstrated to be safe in the hands of competent medical personnel and in a controlled research setting, the CDC findings suggest that it is not appropriate for use by paramedical personnel." Meanwhile, Harvey returned to California and continued to get arrested for running illegal abortion clinics and performing menstrual extractions. After Roe v. Wade, Harvey faded away into obscuity and oblivion. He is remembered by the Jane syndicate members (one of whom immortalized him as "Jordan Bennet" in her book, The Story of Jane) and assorted abortion historians. Planned Parenthood recently revamped Harvey's old ME technique and, in a wise public relations move, decided to pass it off as a new technology rather than drag their colorful buddy back into the public awareness. Whenever you hear abortion promoters talk about the newest, safest abortion technique, remember Harvey and his "super coils." They were the magic bullet in their day, too. There is his obituary from the LA Times. He died in 2008 from a stroke. Notice how disgustingly warped the obituary is.